A mould-breaking play about 1960s civil rights protests in Northern Ireland is one of the first fruits from a study charting the link between arts and activism. Now touring Northern Ireland on the 20th anniversary of The Good Friday Agreement, We’ll Walk Hand in Hand explores civil rights in the 1960s from today’s perspective. Penned by Belfast playwright Martin Lynch, it opened at the capital’s Lyric Theatre and now tours Newry, Derry, Armagh and Cookstown. Untrained actors including refugees and people in the LGBT community are cast alongside professionals in the production, which spins from research led by Brunel University London. 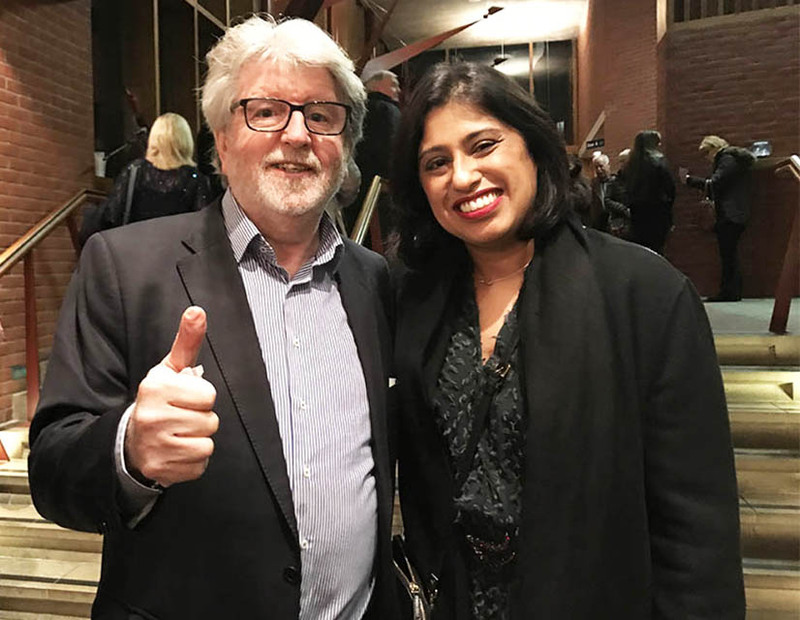 “Staging We’ll Walk Hand in Hand at the Lyric is a major turning point in the project,” said Brunel’s Professor Sarita Malik, (pictured with Martin Lynch). “This has been the first opportunity to see our research around art and activism come to life in a real, live production. We’ll Walk Hand in Hand is about two working class Belfast kids, Vincent and Lesley. When they meet at university in 1967, they find themselves at the centre of the explosive student reaction to the civil rights movement. Their part in the movement sparks conflict with their disapproving families and with each other as Vincent and Lesley confront with decisions that will mark their lives forever. When the story leaps forward to 2018, their granddaughter, Michaela poses the older Vincent and Lesley a different kind of civil rights challenge, as the story fires off in a new direction. We’ll Walk Hand In Hand next shows at Sean Hollywood Arts Centre, Newry on 10 April, Derry Playhouse on 11 April followed by a post-show talk, Marketplace Theatre, Armagh on 12 April and Burnavon Arts Centre, Cookstown, 13 April. This article first appeared on Brunel’s News site.